Exclusive Art Kit for Green Baby Bargains! Only $20 with free shipping! All items will arrive in minimal packaging, the shrink wrap that it will arrive in is eco-friendly. 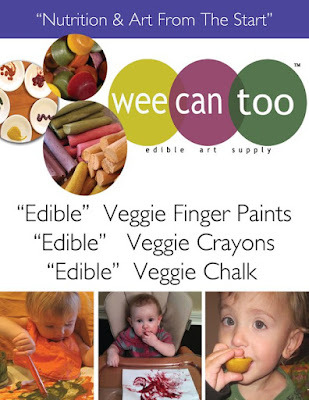 Crayons made from edible ingredients, so as always, hand to mouth safe! 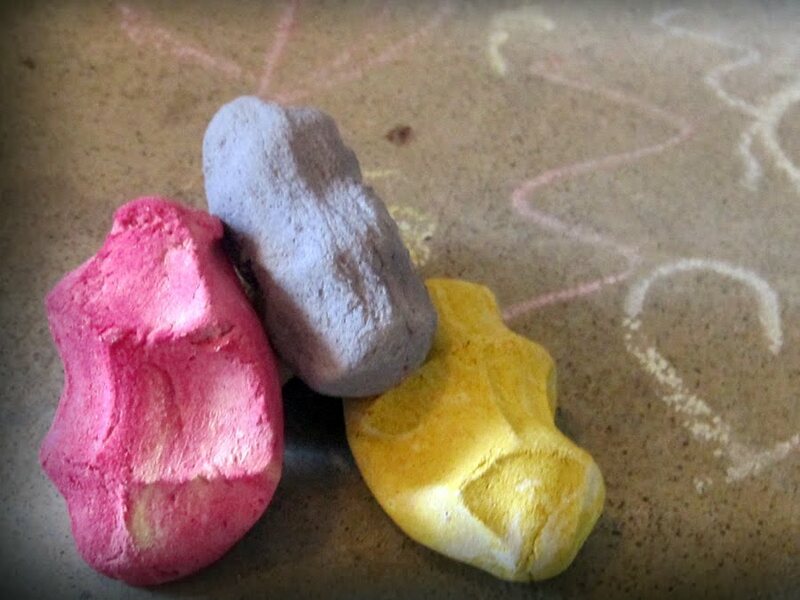 Crayon nuggets tuck into your baby's palm...or squares for stacking and building!Don't worry about petroleum or other toxic additives in our crayons...made with organic ingredients: organic fruit and vegetable powders and practically good for you! VEGAN, no wheat, no sugar, no preservatives! Please supervise children at all times. Not intended as food. We are really excited about one of our newest products. Edible Chalk! Wee ones, decorate the sidewalks... No Lead in this chalk! Safe enough to eat and fun to use! Made with Organic Ingredients. Yes, totally eat-a-ble, totally VEGAN, no wheat, no sugar, no preservatives. 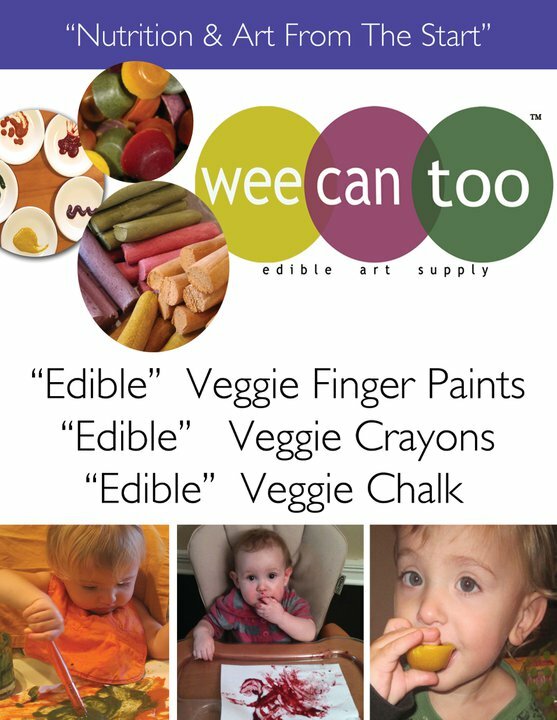 Created in 2007, our finger paint has become our featured product and is very popular with children and parents! Safe enough to eat, Fantastic Finger Paints come in 5 colors! Purple/Blue made with REAL blueberries, Red/Pink made with REAL beets, Yellow & Orange made with REAL pumpkin and Green made with REAL spinach! VEGAN, no wheat, no dairy, no sugar and no preservatives. Unlike the tottle botle, the Grab n' Go set caters to the DIY (do it yourself) momma, makes plenty of liquid paint and comes in eco biodegradable containers for an easy mix! 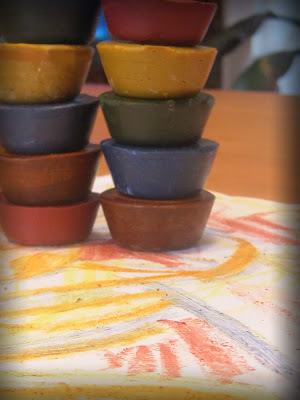 Just add water to powders as your wee artist creates! CPSIA Compliant. 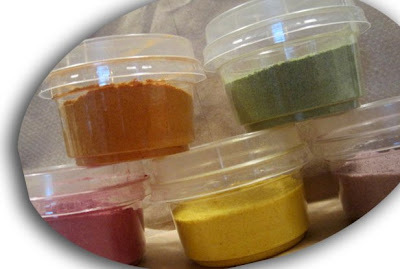 Made from Organic Fruit & Vegetable powders, rice cereal and rice flour! If they can eat, they can paint! Will come in 3 assorted colors.